Flowers are blooming, grass is growing, and the sun is shining—just a few of the many signs that it’s another beautiful summer in Temecula. But does the beauty of your home match the beauty of the summer? 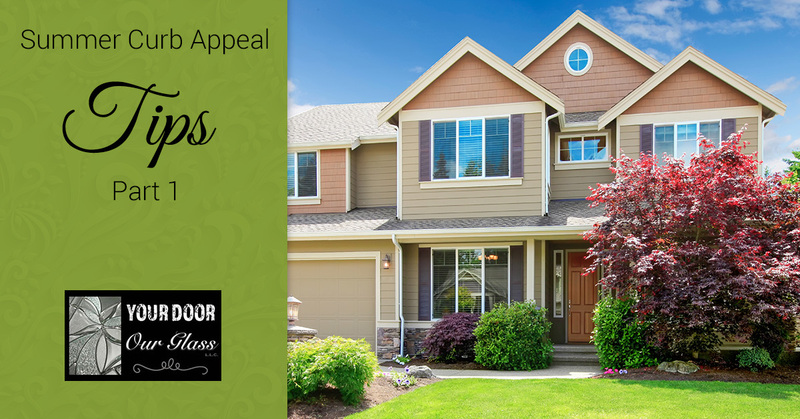 In this blog, Temecula’s glass door design experts at Your Door Our Glass will give you some tips on improving your home’s curb appeal, so you (and your envious neighbors) can enjoy your beautiful front yard all summer long. Your roof doesn’t just serve as protection from fierce and unpredictable California weather—it also plays into the overall look and curb appeal of your home. The average lifespan of asphalt is about 20 years—and during that lifespan, your roofing can experience deterioration, weather damage, and discoloration from algae. These issues can cause water leaks in your home, and can make your roof look old, unstable, and unsightly. To keep things fresh for the summer season, replace some of your older shingles with new ones, and use a garden hose and a bleach-water solution to rinse algae off of your roof shingles (just don’t send that bleach water draining right into your flowerbeds). However, roof repairs of this nature can be a lost cause after a while. If your roof shingles are experiencing universal deterioration or severe discoloration, it’s probably time to invest in a brand new roof. If your home has neutral siding and green grass, there’s a chance your curb appeal is a bit bland and lackluster. Luckily, flowers are a cheap and easy way to add a pop of color (and style) to your yard! Add some perennials to your existing flowerbeds, or build some raised beds on the way to your front door to frame your home’s entryway. Who doesn’t love a short walk amongst the flowers? Whatever you choose, pick a few different colors of flowers for a color punch and some floral diversity. It’ll give your front yard a warm and welcoming feel—and if you’re looking to sell your home, it’s a great way to catch the eyes of potential homebuyers. Not all lawns are created equal—it takes time, effort, and commitment to keep your lawn beautiful year-round. However, the end result can be very satisfying. After all, who doesn’t want a lush patch of green grass to lay on during the most beautiful days of the summer? To improve your curb appeal for potential homebuyers, you’ll need to either learn the basics of lawn care, or hire a professional team to take care of your lawn for you. We’d recommend the latter, especially if you’re going to spend your time on home staging (and hopefully moving) during the home sale process. Stay tuned for part 2 of our series on improving your curb appeal this summer. Until then, catch up on our other recent blog posts!